If you have kept up so far, you may be getting some ideas about what you want to go for, but there’s a further decision to be made – what type of mounting to choose. There are several options. The basic division is between altazimuth (altaz) and equatorial mounts. Altaz mounts have two axes, allowing you to move the telescope up-and-down (in altitude) and from side-to-side (azimuth). What more do you need than that, you might wonder. However, the fact is that celestial bodies don’t move in this way, but more usually move through the sky at an angle unless you are at the Earth’s pole or equator. So an equatorial mount has one axis aligned parallel to the Earth’s axis, so it can counteract the movement by turning one axis only. This is extremely useful when observing, as it means you just have to move the telescope around the single axis to follow an object through the sky. It is well worth having a motor drive, which then does the work for you so that your chosen object remains in the field of view for as long as you want. At least, that’s the theory. In practice, beginners often have trouble setting these mountings up, in which case they make the job of tracking objects even more difficult. 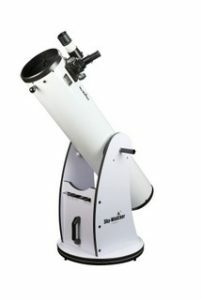 There is a school of thought that says that beginners should be banned from buying equatorial mounts, but the fact is that very many telescopes are supplied on them. Altaz mounts are, however, now equally widespread with motorised and computer-controlled mounts, known as Go To mounts. These have transformed observing, as once you have entered your location, time and date, and aligned the mount on two or three stars, the clever handset knows where all the other stars and planets are. Those elusive deep-sky objects that required ages to find them now present themselves in the field of view at the press of a button or two. Again, at least that’s the theory. The alignment system varies from manufacturer to manufacturer. Most require some user-input, even if it only knowing where north is. Don’t assume that everything is done for you. Probably the easiest system to use is Celestron’s SkyAlign, which requires you to simply drive the telescope to any three bright celestial objects. There are now actually some Go To mounts that contain GPS, and carry cameras that recognise the star patterns, so you just need to plonk them down and switch them on, then let them twirl around for a few minutes while they get their bearings. Once they have done that they are properly aligned on the sky, all being well, and you can dial up the objects for the night’s observing. But while this is very useful, there’s a danger that you will quickly get bored, as it removes the challenge of finding your way around the sky. Yes, there’s a place for them, but it’s a bit like setting a satnav in a driverless car and letting it go to the address you tell it to. You will have no idea how you got there, or where you are when you get there. And of course you are totally dependent on battery power. There’s a lot to be said for an apprenticeship of learning the sky and knowing where everything is. At the other end of the scale is the Dobsonian mount (known as a Dob). This is a very simple altaz mount for reflectors, designed so as to be easy to construct, originally for home telescope makers. It remains the cheapest way to get a large aperture telescope. 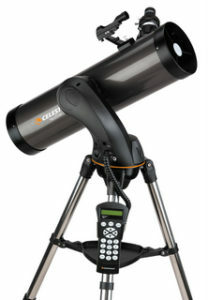 You can get a 250 mm Dob for about the same price as a 127 mm Maksutov on Go To mount, for example. Each instrument has its strengths and weaknesses. The big Dob is ideal for use in the country for finding deep-sky objects under your own steam and will give good views of planets, but you have to keep on shifting the scope so detailed study of the planet is tricky. And you need a fair bit of space to store it and a it’s a bit of effort to lug around. The Mak, on the other hand, is ultra-portable, so you could take it on holiday on a plane without making too much of a dent in your baggage allowance, and will find objects by itself. It will still give good views of the planets, and while not as bright as the image in the Dob, they will stay put in the eyepiece for as long as you want while you study them. So how do you make the decision about what to buy? The above will give you some ideas about where to start, and the pros and cons of each type. You’ll also have to think about how much you want to spend, and whether this is something that you’ll be using a lot or just from time to time when the fancy takes you. Regarding cost, you can get perfectly reasonable telescopes for around £200, with simple but nevertheless usable telescopes costing even less. But if you want the computerised versions then you need to start at around £400. A lot of people these days want to be able to take photos through their telescopes, but do bear in mind that while snapshots of bright objects such as the Moon are quite easy with most telescopes, photos of nebulae, galaxies and other deep-sky objects are much more difficult. In particular, the drive systems that keep an object in view are not good enough for long exposure times. If you want to go down this route, be prepared for a significant outlay, of the order of £1000, for decent results. We have a video explaining in greater detail the choice between refractors and reflectors. 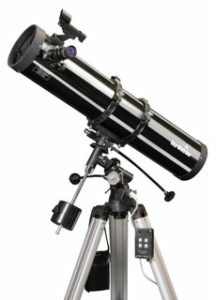 There are many outlets selling telescopes, from camera shops to specialist suppliers and of course Internet suppliers. The trend is for even the specialist suppliers to operate online only, as showrooms where you can go and look at the goods before buying are costly to run. Some do still have showrooms, generally out in the country where space is cheaper than in towns. It may be that they have to charge more than the people who operate out of their garage and keep small stocks, so play fair and order from them if they have helped you by demonstrating their wares. While your local camera shop or even superstore may have a few telescopes in stock, they don’t always know what they are selling and we’d recommend consulting a specialist supplier before buying. An alternative to going to a showroom is to visit an astronomy fair such as Astrofest (held in London in February) or the International Astronomy Show (usually in Warwickshire in the summer or autumn) where you’ll see a large range of goods from suppliers large and small, often at show discounts. And of course there is eBay, where you can find a wide range of goods, often from suppliers with unfamiliar names. All we can say is, do your research among astronomy forums and see if they have a track record. Some suppliers have, sadly, gone bust with no warning so it’s hard to cover yourself completely. Finally, don’t overlook the secondhand market. Telescopes don’t necessarily deteriorate too much, though mirrors may tarnish and screws get lost or even the threads stripped, but many secondhand scopes perform as well after 20 years as when they were new. The SPA Forum has a classified section, and there is also www.astrobuysell.com/uk/ which often has bargains.